We’ve all experienced acute bronchitis. Don’t remember? Imagine what it looks like when someone gets hit in the jaw. There’s the redness, swelling from excess fluid in the area, warmth and pain. Those are the components of inflammation. Now imagine those symptoms in your lungs as you’re trying to breathe and deliver oxygen to the rest of your body. Off the top of my head, I can’t think of a more frustrating diagnosis than bronchitis for both patients and physicians alike. I’ll get into the reasons for that soon enough, but a bit of explanation is definitely in order. Bronchitis is inflammation of a portion of the airways (the bronchi). Far and away, bronchitis is seen in smokers and after a viral, upper airway infection (e.g., a cold, the flu). In that last statement I slipped in two words that create the frustration regarding this condition: viral and smokers. There’s still more to come on what that means for you. There are a few more problems dealing with or treating acute bronchitis. You think it’s worse than it is. 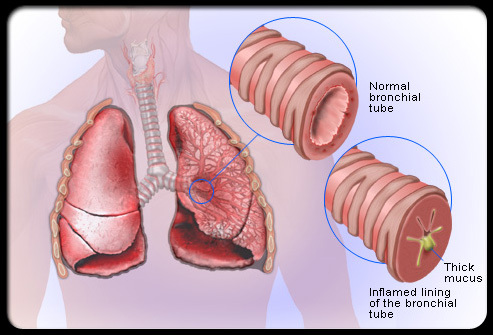 Bronchitis is actually the most common cause of coughing up blood. Coughing up blood or producing blood-tinged mucus tends to make people anxious, and they often start thinking of things like cancer. That train of thought makes some people want to take every test possible to rule out cancer, “just to be sure.” Now your physician knows better and isn’t going to do that unless you have additional symptoms or tell a story more consistent with cancer. That often leads to a lot of frustration and sometimes anger. You don’t take responsible for your part in causing bronchitis. Bronchitis is most often caused by smokers who don’t stop smoking even while they’re suffering. It is a very tense conversation (from both sides) when you return to the ER five days after being seen and diagnosed with bronchitis, and you’re complaining because you’re not better. Folks, even if your physician puts out the fire, if you continue to relight the match, it’ll continue to blaze. You ignore what works and what doesn’t. Bronchitis is not pneumonia, which is an infection of the lungs. In most cases where bronchitis has an infectious cause, that cause is a virus. Viruses do not respond to antibiotics. Your physician understands that you’re sick. Just because you’re sick and coughing, that doesn’t mean you need antibiotics or that antibiotics will cure you. Inappropriate antibiotic use is not without long-term complications that you should want to avoid. In most cases, assuming you remove the source of inflammation (e.g., cigarette or cigar smoke, dust, allergens), your symptoms will improve on their own within a week, and all you need is supportive therapy such as cough, fever and pain medicines along with fluids and rest. You must also practice good hygiene to avoid spreading any viruses that may be causing the bronchitis. The initial snapshot of your condition can change for the worse. What complicates this is when your weakened state and continued exposure to whatever is causing the inflammation allows a bacterial infection to land on top of your bronchitis. Ask your physician if it’s possible that this is what is going on. S/he will know how to proceed, including potentially using antibiotics. In a majority of cases, a diagnosis of bronchitis will be a big source of frustration for patients. From the physician’s standpoint, bronchitis is an easily diagnosed condition due to an obvious cause (such as a cold or cigarette smoking). As such, your physician is likely not to order a lot—or any—tests. Now from the patient’s standpoint, don’t you just hate going to the physician’s office or ER when you’re sick and “nothing” gets done? Well, especially in an ER setting, tests are not used to make diagnoses. They’re meant to be ordered if the results will change the management of the condition or might lead to a change in what is done with you (e.g., admit you to the hospital). Most often, that’s just not going to be the case with bronchitis. Now if after 3–5 days symptoms haven’t improved, you’ve stopped smoking and the mucus you’re coughing up looks a certain way, there’s plenty that will be done differently in most cases. Please don’t take any of this to mean that you shouldn’t be seen for bronchitis. My effort today is to temper your expectations and help you appreciate what your physician is looking for and thinking. Here are some specific signs and symptoms to look for when you’re suffering from acute bronchitis. The presence of these indicates a level of seriousness warranting prompt attention. A documented high fever or have had a documented fever for more than three days. Greenish or bloody mucus, or you are coughing up only blood. Pre-existing heart or lung disease (such as asthma or COPD/emphysema). Over time, bronchitis can become chronic if the source of the inflammation isn’t removed. If you find yourself with ongoing symptoms for over three months, you will fall into a different category known as chronic bronchitis. Your physician will need to address additional considerations for you. So often patients with bronchitis are looking for a “quick fix.” As is often the case, that fix is to be found in prevention. In this case, good hygiene and avoidance of smoke and other lung irritants can save you a lot of the shortness of breath and chest pain associated with bronchitis (pun intended).